In a bizarre development, a Gujarat women's rights group working with backward sections, Shabri Sangathan, has been denied permission to hold a public meeting on the International Women's Day, March 8, to raise issues related with the failure of the state government to implement the National Food Security Act (NFSA), 2013. She added, women are the most affected sections because of the “failure” to implement food security, one reason why the organization decided to highlight it on March 8. “Why should we celebrate the International Women's Day on March 10?”, Mistry wondered, adding, “We had announced our decision to hold the meet at the historic Dandi Bridge in Ahmedabad quite some time back. However, a poor women's organization is not allowed as cops will be busy with Modi”. 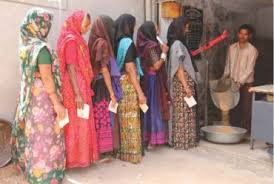 “Women have been told to come to Ahmedabad for the meet from all over Gujarat. They will be here. We will hold our meeting at the spot designated for it. There is no question of taking back our decision”, she insisted. Mistry regretted, though it is four years since the NFSA was passed, the state government began implementing the Act on April 1 as Maa Annapurna Yojna only after a Supreme Court rap in February last year. "Even today, the Act is not being implemented properly", she alleged.